In a futuristic world, young Marty stumbles upon a bionic arm which endows him with superhuman powers and put him at the centre of a centuries-old struggle between good and evil. His teenager heart will now begin a long-way training together with two loyal friends: Buttons, his robo-puppy, and the brave Ally. 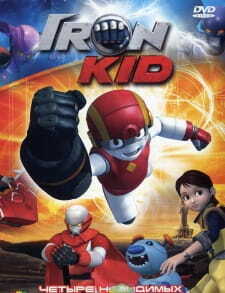 Eon Kid also know as Iron Kid is a memory of my childhood.And i m writing this review as a kid watcher.The story is about Marty,Marty is a small, young kid with small, preppy brown hair. He wears a yellow overall, with 2 long straps that extend over his shoulders. He wears also half-ripped blue jeans, carrying a small brown bag slung over his left shoulder. He accidently obtain the power of Eon.He got the Eon fist which give him a huge power.First he did not able to unlock full powers but after getting some training by a old dude he able to master the fist powers.He can wear the Eon Armor, he is completely covered in metal, having his torso and most of his body colored in red, while the rest are covered in a silvery-gray colored metal. Guff a swordman who is guardian of that fist becoming companion of marty there mission was to defeat a Powerful General.Marty have robot type dog with him he was marty friend.A girl which was cause of marty getting the Eon fist.Marty tries to protect her from the evil people who tries to use her brain to awake a powerful robot.She becoming marty close friend.But the evil people use her to awake the powerful robot but she was also able to close him again. Lots of other chracters which i cant explain right now like Khan and others. Overall when i was a kid i like this series very much , hope it will be quite useful for you and your kids.But i m not sure if you are now adult and dont like it.